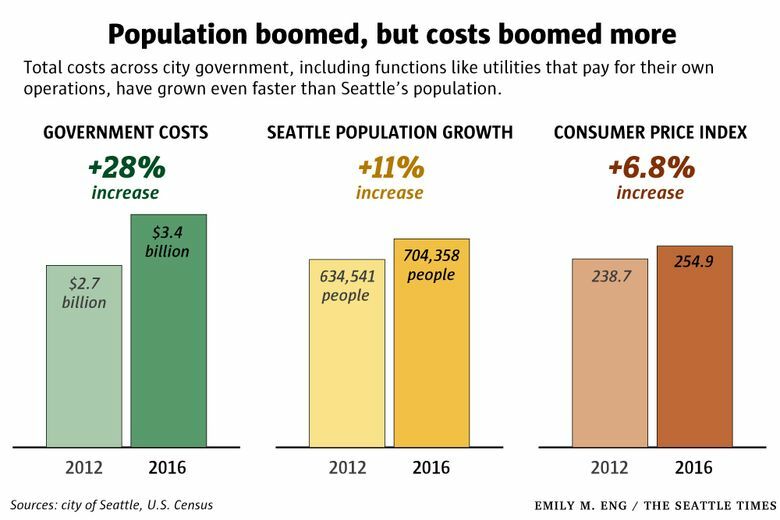 The cost of Seattle's government grew faster than almost any major U.S. city over five years, propelled by surging tax collections and an expanded scope of government services. During his three-plus years as Seattle’s mayor, Ed Murray built a staff around him that mirrored the city’s rising population and wealth. He recruited a senior aide to New York City Mayor Michael Bloomberg to lead a new innovation team. He hired more executives than his predecessor, with salaries topping $170,000, and brought on advisers for public safety and homelessness. By Murray’s final year in office, his staff had grown by about a third and his budget by 70 percent. The Mayor’s Office wasn’t the only one to expand. Almost every city department increased in size over the five years ending in 2016. 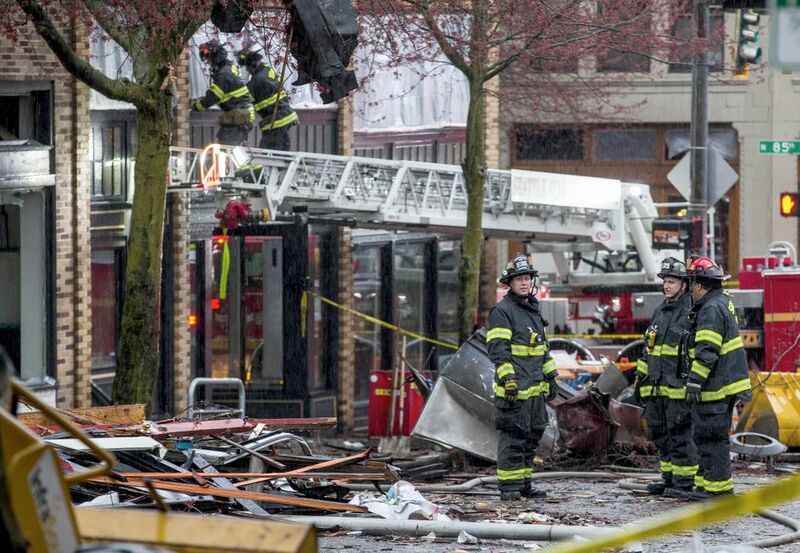 Public-safety costs soared by $100 million. Transportation expenses doubled. The city shelled out $1.1 billion on employee wages last year, with nearly half of full-time workers making at least $100,000, according to a Seattle Times examination of thousands of payroll records, budget documents and financial statements. Seattle added 11 percent more residents over these five years — the fastest of any U.S. city with at least a half-million people — but government spending accelerated even faster. Excluding city services like utilities that pay for themselves, government costs shot up nearly 40 percent, among the sharpest increases of any major U.S. city. While the influx of new residents has added to the strain on city services, the ballooning costs also reflect longstanding obligations, like pension benefits, and a mayor and City Council moving to address a range of social issues. Paying for this expansion has been easy. A building boom, rising property values and a general willingness by voters to approve ever-larger levies have contributed to a 35 percent surge in tax revenue in five years. Yet the construction frenzy is cooling. Future levy campaigns will have to win over voters feeling the bite of rising taxes on their homes and rents in an increasingly expensive city. Any decline could present a challenge for Seattle’s new mayor, Jenny Durkan, as she pushes to make community-college tuition free and provide more mental-health and drug-addiction services. “So much of the city’s revenue thirst has been quenched with taxes that aren’t necessarily sustainable,” said John Wilson, King County’s assessor, who warned against assuming voters will approve future levies. “It’s not an infinite ATM machine to tap,” he said. After a period of relatively flat spending during the recession, the city’s costs began to climb in 2012. The city added the equivalent of 850 full-time employees over the next five years, bringing its ranks to about 11,760. Full-time city workers earned a median of $99,184 in salary and overtime last year, a 12 percent increase over five years, remaining above the median household income for city residents of about $80,000. 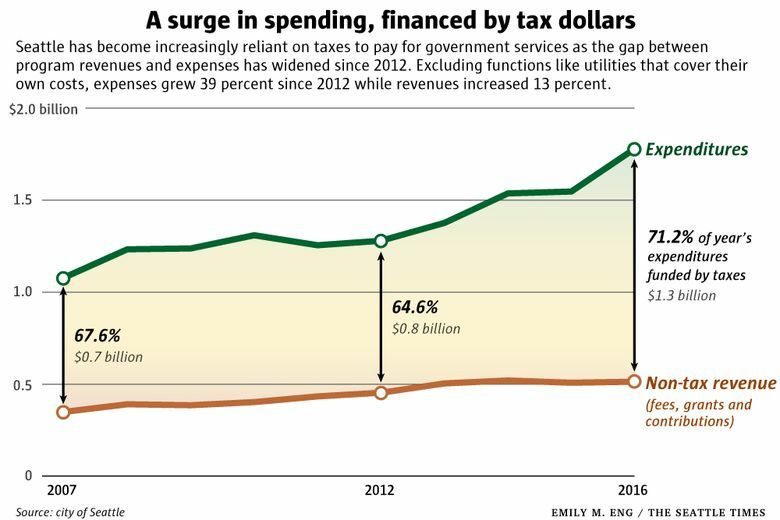 As fast as the city’s spending has risen, it has brought in tax revenue even faster. Its cash reserves have grown sharply over five years to $1.3 billion. Though some of that money is earmarked for specific work, Moody’s, the credit-rating agency, cited the city’s ample cash and modest debt as a sign of good financial health in a May report. Still, the average annual property-tax bill in Seattle spiked by $920 in the past two years alone, a cost that is often passed on to renters. The city’s growing reliance on property, business and sales taxes has been noted with alarm by the Municipal League of King County and others. “How does Seattle balance its progressive values and the looming reality of limited resources?” the League wrote in a report earlier this year. Tammy Morales, a community activist in South Seattle, supported the city’s $290 million levy for affordable housing last year in hopes it would help combat gentrification. At the same time, she worries that property-tax hikes will further push up the cost of living, and wonders whether the city is using all that money efficiently. Current and former city officials have pointed to greater demands on public safety and the electrical system, owing to the increase in population, construction and the region’s homelessness crisis. But the city hasn’t only added police officers, firefighters and linemen. The mayor’s office budget totaled $6.4 million in 2016, which included some employees on loan from other departments and was further supplemented by a Bloomberg Philanthropies grant. Murray rejected this characterization. “I was the person trying to bring fiscal control into the city at the time it was growing rapidly,” he said, adding that the mayor’s office had been too thinly staffed to govern effectively. Murray, who resigned in September amid sexual-abuse allegations, said the taxes he championed have made the city more livable, providing subsidized prekindergarten and additional bus service in a traffic-choked city. Much of the big-ticket construction work that took place under his watch was greenlighted before he assumed office, he said. Across the city, Seattle employed about 250 executives last year, roughly 40 percent more than in 2012. Strategic advisers, who assist senior executives or help shape major policies, numbered 767 during 2016, about 300 more than five years earlier. The Department of Finance and Administrative Services had 65 strategic advisers who worked full time last year, twice as many as in 2012. The increase was partly to support additional work, such as coordinating a push to provide homelessness services, according to spokeswoman Cyndi Wilder. City Light had 38 executives last year, 12 more than in 2012. Scott Thomsen, a spokesman, attributed the increase to reclassifying managers as executives to make their pay more competitive. “We were losing some of them to other utilities,” he said. The utility is among several departments that are struggling to manage workloads, officials say. Altogether, the city spent a total of $96 million on overtime last year, almost 50 percent more than five years earlier. 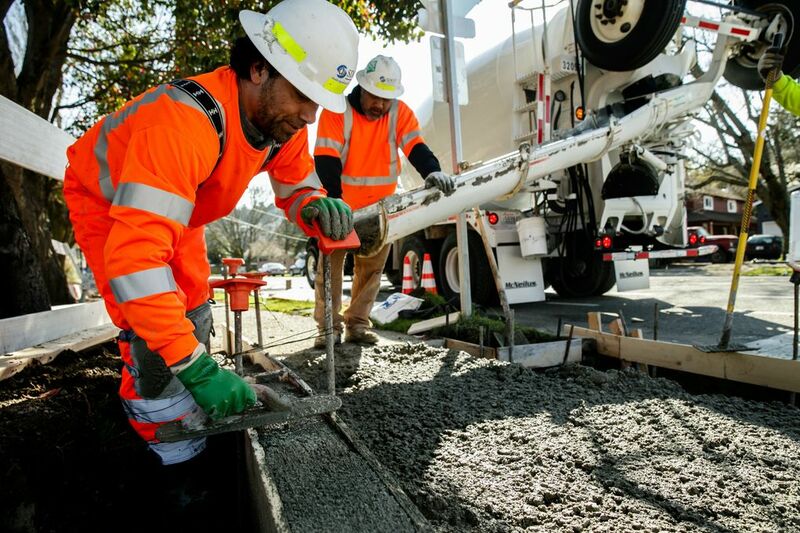 City Light is coping with greater demands stemming from construction, such as the legally required work of marking where cables run underground so people don’t strike them while digging. One worker who locates underground cables earned $175,000 in overtime last year — the most in the city. 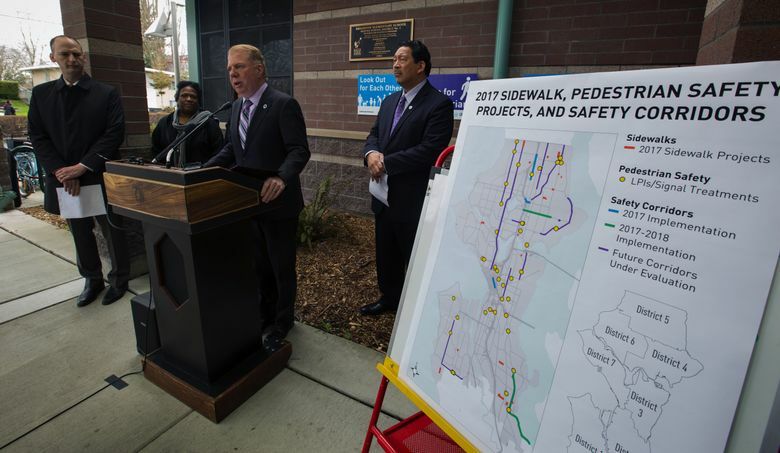 Citywide, public safety remains Seattle’s largest cost. It came to $577.6 million in 2016, according to the city’s audited financial statements. One Fire Department ambulance crew in Belltown responded to an average of 22 incidents a day last year, which Fire Chief Harold Scoggins said was the second busiest in the nation. Dozens of vacant positions, he added, have contributed to overtime costs that rose 37 percent from 2012. The Seattle Police Department, with just over 2,000 full-time employees, added more than 100 workers over five years. Overtime costs still increased 45 percent. A city audit in December found that the department dispatched officers to 19 percent more special events last year than in 2012 but spent 75 percent more on wages for such work. The auditors found that SPD doesn’t fully recover its costs for any type of event and called for additional oversight. An audit last year uncovered numerous flaws in the department’s overtime practices. 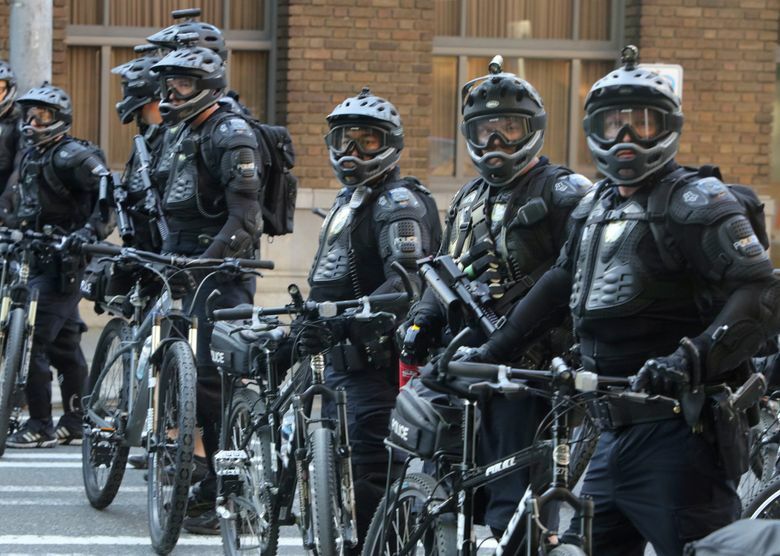 Brian Maxey, SPD’s chief operating officer, said overtime has increased largely due to staffing special events — from protests to marathons — and enhanced training. The department has created an overtime policy and hired additional staff to help monitor compliance. Maxey says SPD plans to add another 100 sworn officers over the next few years and he believes it will need still more. “The reality of modern policing is that there are very, very high expectations and we strive to meet those and it’s expensive to do so,” he said. Seattle’s rate of spending stands out next to other large local governments in the Puget Sound region, including services like utilities and public transit that pay for themselves through customer fees. King County, Tacoma and Bellevue reported spending increases between 14 and 18 percent over the last five calendar years, while generating revenue from services at the same rate or faster, according to their annual financial statements. Population increases ranged from 5 to 7 percent over that time. The Seattle government’s total expenditures went up 28 percent over those years, while revenue — largely from providing electricity, water and waste disposal — rose only 18 percent. 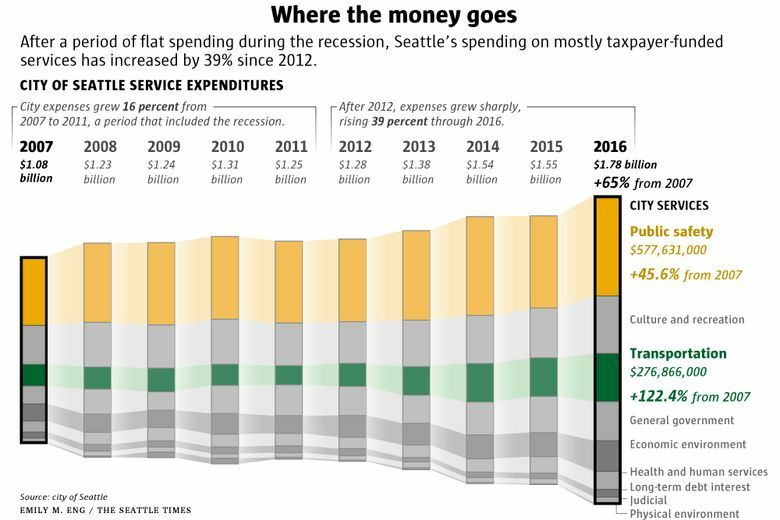 Seattle’s increase in spending was an even sharper 39 percent when excluding services that cover their own costs. Among 45 U.S. cities with between 350,000 and 1 million residents, only Minneapolis had a sharper increase, according to data provider Merritt Research Services LLC. “Even for a growing city, it’s a sharp increase in public spending,” said Justin Marlowe, a professor of public finance at the University of Washington. To some extent, he added, Seattle and others are stepping up to pay for a range of social services, from affordable housing to mental health, where federal funding has diminished or not kept up with actual costs. 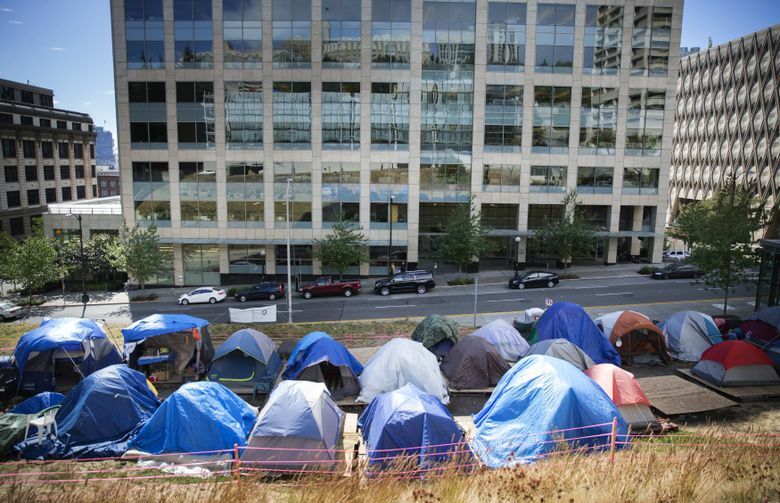 “What you see in Seattle is it’s on the front line of cities that are just kind of taking these things into their own hands, building out services at the local level that haven’t really existed,” he said. In 2012, the city created the Office of Immigrant and Refugee Affairs, and its budget has subsequently expanded more than tenfold to $3 million. In 2015, Seattle transformed a small education team into the Department of Education and Early Learning, which has a budget of almost $80 million for 2018. Murray also created an Office of Labor Standards, partly to enforce the city’s minimum-wage law. “To some degree, the growth of government is a good thing, because we’re a city doing cutting-edge work, said Giulia Pasciuto, policy analyst at Puget Sound Sage, a nonprofit organization that advocates for racial and social equity. The city’s $5.6 billion budget for 2018 includes $63 million for homelessness programs, up from $39 million in 2014. Taylor Hoang sees the homelessness crisis up close, with people sleeping in tents and cars near her restaurant in Sodo, and believes it is a critical issue for the city to address. Still, she wants the city to do more with existing resources before trying to tax businesses. “I think the city has quite a big fund dedicated to health and human services,” said Hoang, now a co-chair of Durkan’s new Small Business Advisory Council. No category of government spending went up more steeply than transportation, which doubled over five years to $276.9 million. The costs include everything from laundry and pothole repairs to the charges that don’t result in immediate cash payments, like wear-and-tear on a sidewalk, according to a detailed breakdown provided by the city. Not included are some large construction and labor costs because the finished products — roads, for instance — are counted as assets. Notably, wages and benefits paid out of the transportation fund increased by 49 percent over five years to $82 million last year. Pension contributions nearly doubled to $10 million. So far, taxes have been adequate to cover the city’s higher spending. But there may be turbulence ahead. City budget officials estimate that almost a fifth of business and sales taxes are linked to building activity, which they expect to slow. Property taxes can be volatile: Collections fell by about $11 million in 2015 as levies expired and jumped by $122 million in 2016 as new levies took effect. Seattle residents are in for higher property taxes even without new city levies because state legislation is set to raise court-mandated funds for education. The City Council, meanwhile, is looking for other sources of revenue, approving a new tax on sugary drinks in June, but other efforts have hit some roadblocks. The council in November narrowly rejected a tax on certain businesses that would have raised funds for homeless services. Days later, a judge struck down a new city income tax on wealthy households. City officials are appealing. Some Seattle residents are hoping the city will try harder to live within existing resources. Glenn Singer, a Wallingford Community Council board member who moved from the Philadelphia area six years ago, has experienced culture shock watching Seattleites repeatedly approve tax increases. Yet even some openhearted neighbors grumbled over their latest property-tax bills, he said.